Four senior members of the House of Representatives sent a letter to Mark Frownfelter, Associate Director of the Security Division of the Executive Office of the President, inquiring whether White House Deputy Chief of Staff Karl Rove is still eligible for a security clearance given allegations of criminal conduct, RAW STORY has learned. The four Members who signed the letter are Committee on Energy and Commerce Ranking Member John D. Dingell (D-MI), Appropriations Committee Ranking Member David Obey (D-WI), Defense Appropriations Subcommittee Ranking Member John Murtha (D-PA) and Armed Service Committee Ranking Member Ike Skelton (D-MO). Recent revelations made public by United States Attorney Patrick Fitzgerald have raised questions about the maintenance of a security clearance by Deputy Chief of Staff Karl Rove. "Guideline E- Conduct involving questionable judgment, untrustworthiness, unreliability, lack of candor, or unwillingness to comply with rules and regulations could indicate that the person may not properly safeguard classified information." "Guideline J- Conditions that could raise a security concern and may be disqualifying include: Allegations or admissions of criminal conduct, regardless of whether the person was formally charged." 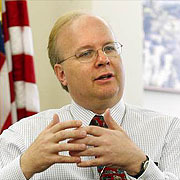 Under these guidelines is Mr. Rove still eligible for security clearances? If Mr. Rove were to apply for a security clearance today, could either of these guidelines disqualify him from being awarded a clearance? We appreciate your answer to these questions, and look forward to your response no later than November 18, 2005.